Our first stop in Durbs is with my aunt and uncle in Gillitts, a small town on the edge of Durban. It is a wonderfull break after spending five days in the mountains. It is wonderful to see them again. Their beautiful house is a santuary for sick and abused tortoises, the garden being divided up into numerous tortoise pens by calf-high fences. The local african Sangomas (witchdoctors) use tortoise shell for their remedies. As a result many tortoises are brought in (alive!) with their shells smashed open. It is very sad, especially as they actually have nerves in their shells so this would be very painful for them. The other major problem is people taking them as pets, as they have very particular food and habitat requirements and will get sick and die if removed from them. We then move on to stay a couple nights with my Grandmother who lives in the heart of Durban city. Going into Durban is a bit worrying, even for me, having been there many times in my childhood. The crime is very bad there. Just leafing through the local paper most of the articles involve muggings, stabbings, people getting shot in the face etc etc. Outside her apartment seems to be a major taxi thoroughfare and there is constant hooting and shouting as they aggressively peddle their ware. My grandmother tells us of once seeing a lady actually being manhandled into a taxi. She managed to kick off the over-enthusiastic conductor and sat down again at the bus stop as if nothing had happened. After some safety tips from my Gran, who doesn’t go outside the building without a carrying very large opened safety pin in her bus-ticket hand, we managed to spend a morning exploring the city without incident. We saw some of the ocal attractions, Sea world, the beach and some of the city. I have to say we were fairly tense and very wary the whole time. Its quite a grim city, we passed several completely derelict buildings in the middle of Durban and right on the beach. Our first stop in Durbs is with my aunt and uncle in Gillitts, a small town on the edge of Durban. It is a wonderful break after spending five days in the mountains. It is wonderful to see them again. Their beautiful house is a santuary for sick and abused tortoises, the garden being divided up into numerous tortoise pens by calf-high fences. 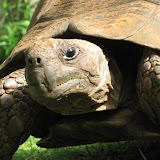 The local african Sangomas (witchdoctors) use tortoise shell for their remedies. As a result many tortoises are brought in (alive!) with their shells smashed open. It is very sad, especially as they actually have nerves in their shells so this would be very painful for them. The other major problem is people taking them as pets, as they have very particular food and habitat requirements and will get sick and die if removed from them. Adventures of Dean and Sophie is powered by	WordPress 2.8.5 and delivered to you in 0.205 seconds using 33 queries.